There are many brands to admire on Instagram, but Daniel Wellington takes the cake. With over 2.3 million Instagram followers and growing, Daniel Wellington is practically a household name in the Instagram world. They make sleek and classy watches at a surprisingly affordable price, and they have taken the watch industry by storm. Founder, Filip Tysander, started the company by himself, but now has a team of more than 100 people in five different cities including Los Angeles, New York, Stockholm, Hong Kong, and Shenzhen, China. We are huge fans of the way that Daniel Wellington utilizes Instagram marketing, and takes their brand to the next level. They have had phenomenal success since their initial launch. In 2014, Daniel Wellington sold more than a million timepieces and took in $70 million in revenue. Their numbers have only continued to grow as the years have gone by. It’s unique that Daniel Wellington chose to focus mainly on Instagram for their visual marketing, but it is clearly paying off in a big way. 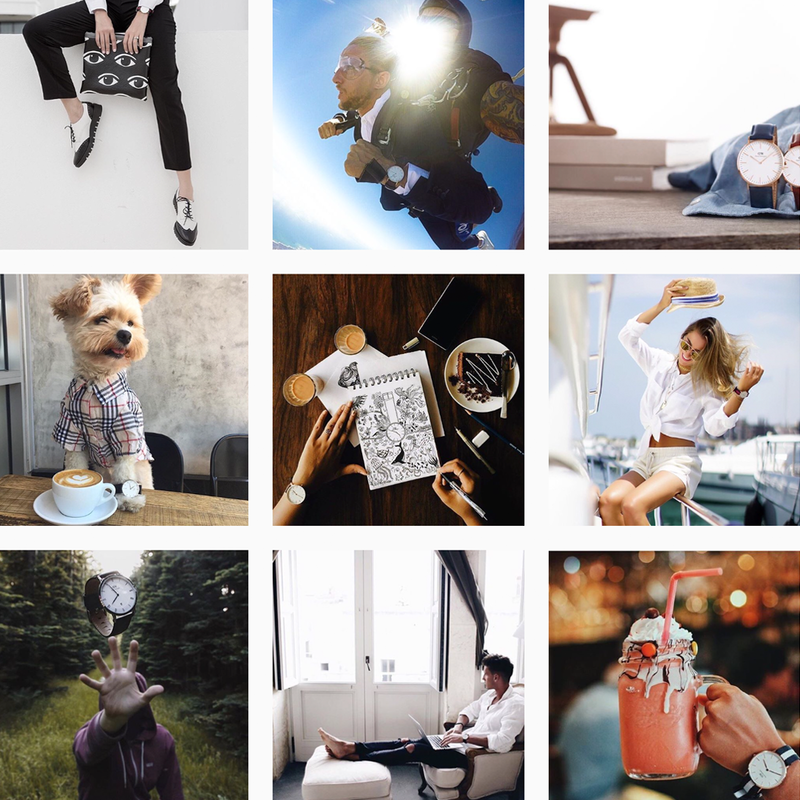 Here are a few key points that make Daniel Wellington a loved brand on Instagram. Partnering with various influencers is one of the most significant factors to the brand’s success. The company regularly teams up with renowned social-media stars, well known bloggers and prominent personalities to gift product as a form of organic advertising. Who is going to turn down a beautiful watch? Founder, Filip Tysander, has managed to avoid any form of traditional advertising entirely, but the brand is clearly not suffering by any means. It seems that watch brands have traditionally avoided using social media for some reason, which left Daniel Wellington without much competition. Other brands might be trying to catch up, but the DW brand has left everyone else in the dust in terms of social media. Many brands are trying to jump on the social media train now, but it’s difficult to succeed if it’s not done well. Consistency is key when it comes to Instagram, and Daniel Wellington has done an incredible job by marketing their brand in an appealing and consistent way that also focuses on the lifestyle of his target market. 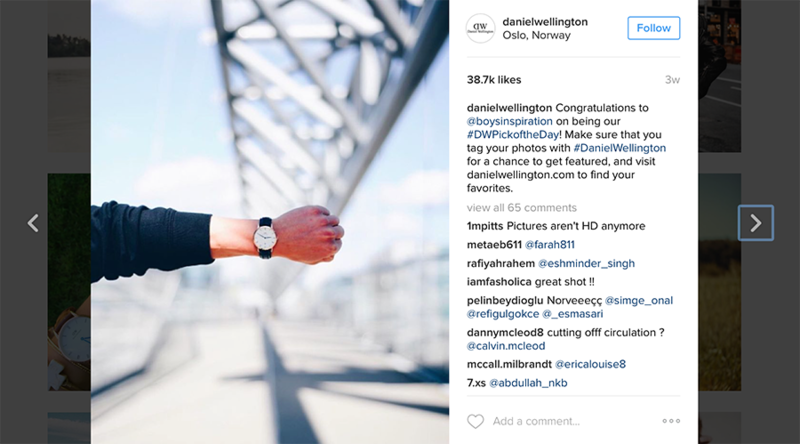 Another reason for Daniel Wellington’s visual marketing success is their ability to engage with their followers. When a brand interacts with their audience, it sparks a relationship between that person and the brand; and as a result, creates a community. Daniel Wellington does a fantastic job with that by having caption contests and sharing their customer’s photos (user generated content). They’ve also created a hashtag campaign called #DWPickoftheDay, where they choose one photo a day of someone wearing their product and reposting it to their own Instagram feed. This encourages their customers to not only snap photos of their product, but to get creative with their Instagram content so they have a better chance to be chosen for “the pick of the day” regram/repost.